Trading Standards | The Bloxwich Telegraph – incorporating The Bloxidge Tallygraph and Walsall North News. Founded 2006. Banned artificial colours linked to hyperactivity, asthma and cancer have been discovered in takeaway and restaurant dishes being served in Walsall during product testing. 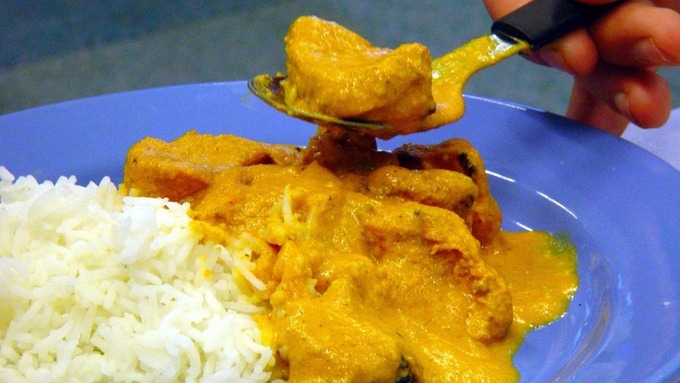 Seven out of eight chicken tikka or chicken tikka masala dishes tested by Walsall Council’s trading standards team were found to contain one of two banned substances Sunset Yellow(E110)and Ponceau 4R (E124) – a red colouring. Since 2013 they have not been allowed in seasonings and curry pastes. An eighth dish which was tested and was noticeably less red in colour did not contain either. Other artificial colours linked with hyperactivity in children were also found during testing but were within approved limits. Trading standards officers are now working with the businesses surveyed to make them aware of their responsibilities when preparing and selling food. They are also urging all business owners to examine labels to ensure banned colours are not added to food and others are used in acceptable quantities. Lorraine Boothman, interim trading standards manager, said: “Food labelling regulations do not require takeaway food and restaurant meals to be marked with a list of ingredients so customers are putting their faith in food businesses to use permitted colours and to not exceed set amounts. “As an alternative to artificial colouring we actively encourage businesses to use natural colours such as tumeric, saffron and paprika.Our officers are happy to give advice to any business to help them comply with any of the legal requirements. Rogue workers targeting Walsall’s elderly – alert! Rogue workers conned an elderly man out of his £2,500 savings and tried to persuade him to transfer ownership of his house to them, Walsall police and the council’s trading standards officers have reported. Three men in a white van targeted the Pelsall pensioner over two days last month (June 2012), offering gardening services and pest control. Police and trading standards say there has been an increase in these type of incidents over the last month with rogue traders offering roof restoration, pressure washing, chemical treatment, gardening and pest control services. They pressurise their victims, who all appear to be over the age of 80, and in many cases they have handed over large sums of money for unnecessary work. In the Pelsall case, the elderly victim paid three men money for a small amount of gardening and to deal with a rat infestation that they told him he had in the garden. They also tried to persuade him to transfer ownership of his home to them. Meanwhile an 84-year-old man in Blakenall handed over £25 to two men posing as WHG callers, who also had a white van. And a 93-year-old woman in Shire Oak was persuaded to let a male cold caller into her home who said he wanted to cut a tree down. Condemning the criminals, Councillor Zahid Ali, Walsall Council Coalition’s portfolio holder for Public Protection,said, “Honest traders have nothing to fear – we are issuing a warning about rogue traders. “We are advising people that if they need garden work doing, trees cutting down or repairs made to their home they should always obtain several written quotes from reputable firms and not be intimidated by cold callers. “There is a list of businesses in the home improvement sector online at www.traderregister.org.uk/walsall or they can call 01922 652246 and our staff will search the Walsall Trader Register on their behalf. “If in doubt discuss plans with a family member and never allow anyone into your house or pay them money if you have not asked for work to be done. Reputable organisations such as WHG would not charge for any work that was necessary at a tenant’s home. Walsall police are working closely with trading standards to protect the public and honest businesses operating in the local community from rogue traders and illegal practises following this increase in reports over the last month. As part of this continued work, officers are asking members of the public to follow some simple crime prevention advice before agreeing to have work done at their homes. Officers are reminding people not to hand over large amounts of cash upfront or be pressurised into having work done by doorstep traders. With thousands of people expected to carry out DIY and home improvements over the coming months, residents are being encouraged by Walsall Council to make sure that if they do work themselves that it complies to safety standards, and if they employ a trader to make sure they are honest and reliable. Walsall TraderRegister is a Trading Standards scheme which is designed to put residents in touch with traders who are committed to doing a good job at a fair price. Local firms and traders were invited to join and register their business after agreeing to conform to the Walsall TraderRegister Code of Practice. The website has recently been revamped and residents are encouraged to take advantage of the scheme. To date, businesses from a variety of trade types including builders, electricians, tree surgeons, painters and decorators, bricklayers, fencing and drainage firms have been added to the database. To find a reliable, professional and honest trader, residents can take advantage of two options. For those with access to the internet, they can visit www.TraderRegister.org.uk/Walsall and click ‘Find a Trader’. They will be able to search the database for tradespeople who are on the TraderRegister database. If there are no traders in the category they have selected, traders on nearby similar registers will be listed. Businesses and traders who are interested in joining the scheme can apply online at www.TraderRegister.org.uk/Walsall or contact Walsall Trading Standards on 01922 652246 and request an application form.